SQL Server 2014 Hosting - HostForLIFE.eu :: How to Check Last Accessed And Modified Table Data in SQL Server? Similarly if we want to see how current indexes are performing on table we can see user scan , user seek or look ups. Maybe you were recently doing a clean up of your website database, then you create some tables on your database but never adding any new rows to it. 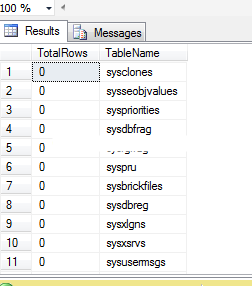 In this tutorial, I will tell you how to detect empty row in a table on SQL Server database. SQL Server 2014 Hosting - HostForLIFE.eu :: How to Use Trigger in SQL Server 2014? A trigger is a special kind of stored procedure that automatically executes when an event occurs in the database server. DML triggers execute when a user tries to modify data through a data manipulation language (DML) event. DML events are INSERT, UPDATE, or DELETE statements on a table or view. These triggers fire when any valid event is fired, regardless of whether or not any table rows are affected. This After Trigger run after an insert, update, or delete on table. They are not support view. Disaster Recovery plans and infrastructures are a necessity for large enterprises for which operating would be an issue if their mission critical applications were to crash or become unavailable. Most DR infrastructures have adopted the method of replicating the infrastructure and hardware of the primary site at a backup location; this ensures that when an issue occurs at the primary site, applications can still be served from an unaffected location that contains the necessary capacity. However, replicating an already complex infrastructure is time consuming and costly to not just build, but to maintain too. Cloud DR looks to build upon DR plans by providing a virtualized cloud infrastructure that is able to operate idly with minimal resources, but can scale up to cope with demand when the primary site fails. Moving a DR configuration into the cloud can help you to realize huge cost savings by reducing the amount of physical infrastructure that you need to maintain and rely on to protect you in the event of a disaster that takes down your primary data center locations. Because a DR environment only requires resources that are of a bare minimum when it isn’t being actively used, the amount that you are paying will also be the bare minimum. As a physical DR environment is comprised of hardware and resources that are equal to that of your primary sites, the amount being paid for is often the same as that of the primary site, the only difference being that most of the time these resources are lying idle. So in effect, with traditional DR you could be paying for unused resources a lot of the time. In a cloud DR configuration, if it is called into action then additional resources can be automatically provisioned as the environment scales to cope with the demand being placed on it. Once demand recedes, the resources are then returned to the cloud. With cloud DR you will only ever be paying for resources that are actually being used, which is where the cost efficiencies arise. With traditional DR, the capacity of the DR environment is equal to that of the primary site. So whilst there will be enough capacity to meet demand when the primary site is down, it does mean that even when the DR environment is in use that there could still be a substantial amount of free resources. These are free resources that you will still be paying for. DR in the cloud accounts for this unpredictable demand by scaling up to account for the demand placed on it, so you are only ever paying for resources that are actually being used, therefore there will never be any spare resources. This can also be of assistance for times where demand is actually more than even the primary site can handle. With cloud DR, the backup environment will be ready to serve your mission critical applications the moment any issues are detected at your primary sites. In the event that your primary site does become unavailable, your end-users shouldn’t notice any difference as we have designed the failover process to take place with minimal downtime. Once your end-users have been transferred to the DR environment, you can get to work repairing the primary site as soon as possible to minimize the amount of time that is spent utilizing the recovery site. Once you have repaired the issue and are confident that the primary site is ready to be returned to live use, the transfer from the DR site to primary site will also be flawless and completed with minimal downtime. These processes make sure that issues don’t have the opportunity to have a large, negative impact on your business; although sometimes they may take time and money to repair, from your end-user’s perspective at least your business will continue to operate as normal because they will still be able to access their mission critical applications and data without issue. Try our new Cloud Hosting as low as €3.49/month!! As we have explained above the benefits using Cloud. Now, you can try our new Cloud technology start from an affordable cost. 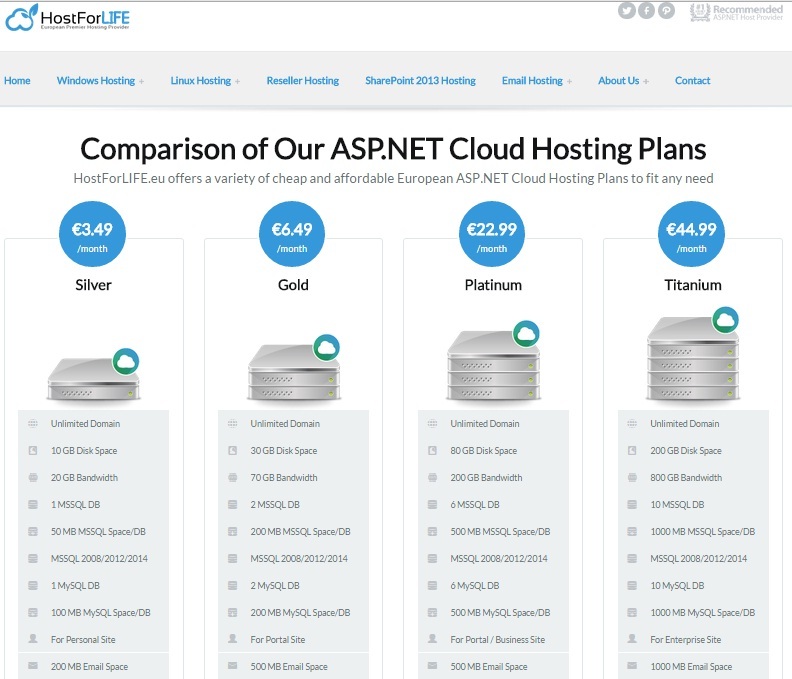 For more information, please visit our cloud official site at http://hostforlife.eu/ASPNET-Cloud-European-Hosting-Plans.